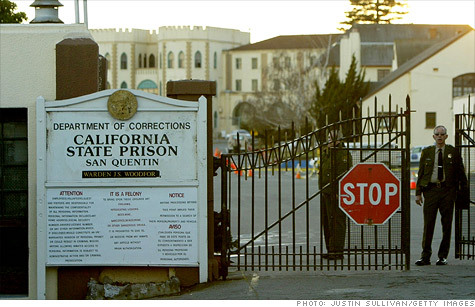 California's San Quentin prison is famous for hosting both Johnny Cash concerts and the state's most dangerous inmates. NEW YORK (CNNMoney) -- Taxpayers have spent $4 billion since 1978 on California's capital punishment system -- and with only 13 executions to show for it. That's about $308 million per execution. And without substantial changes, the state's total bill will expand to $9 billion by 2030, according to a new study by federal appeals Judge Arthur Alarcón and Paula Mitchell, his law clerk and a professor at Loyola Law School. The situation is now so severe, voters must choose to pay higher taxes or abolish the death penalty, the authors say. The study's release comes at a time when fiscal policy is a hot topic in California. And the state's $26 billion deficit is already hitting the criminal justice system. Gov. Jerry Brown announced in April that he is canceling the long-planned construction of a new housing facility for condemned inmates at the state's infamous San Quentin prison. With a backlog of 714 prisoners currently on death row, Alarcón and Mitchell call California's capital punishment system "dysfunctional," and "a debacle." The rare comprehensive review of the state's death row costs estimates that prosecuting death penalty cases is $184 million more expensive every year than if those cases had been life without parole prosecutions. "Nobody can really with a straight face say this is a system that is working," Mitchell said in an interview. The state attorney general's office did not immediately respond to a request for comment. Thirty-nine crimes are now punishable by death in California, as voters have repeatedly expanded the program through the state's unique direct voter initiative process. The cost of expanding the death penalty was never accurately presented to voters, Alarcón and Mitchell argue. The result is a crawling appeals process that costs taxpayers as much as $300,000 to hire private attorneys for indigent prisoners, the authors say. And despite the big tab, a substantial number of inmates don't have adequate legal representation. "The long wait for execution -- which has been over 20 years for each of the five inmates executed in the last 10 years -- reflects a wholesale failure to fund the efficient, effective capital punishment system that California voters were told they were choosing," the report says. But Kent Scheidegger, legal director of the Criminal Justice Legal Foundation, a nonprofit organization that advocates for victims rights, said California does not sentence too many people to death. Instead, the state should work to resolve appeals faster, expand the pool of attorneys who are qualified to handle death penalty cases, and cut down the number of times the penalty phase is reviewed in court, Scheidegger said.